With an ATX form factor, the ASUS Z11PA-U12 LGA 3647 ATX Motherboard features the Intel C621 chipset and an LGA 3647 socket. Powered by the Intel Xeon Scalable Platform, this motherboard is designed for deep learning application development, education, SMB groups, print/file/mail, or entry storage servers. There are also 12 DIMM slots, which are compatible with 4GB, 8GB, 16GB, 32GB RDIMM, 32GB and 64GB LRDIMM, and 64GB and 128GB LR-DIMM 3DS. The Z11PA-U12 has a total of three mini-SAS headers that can support a total of 12 SATA III 6 Gb/s ports, as well as a single M.2 connector that supports 2242, 2260, and 2280. This ASUS motherboard has 12 DIMM slots. Together with dual double-deck GPUs, this motherboard is an ideal platform for deep learning application development and education. Featuring dual onboard OCuLink, this motherboard provides efficient port-to-port connections with most OCuLink-supported NVMe devices, eliminating the need for PCIe transaction cards. 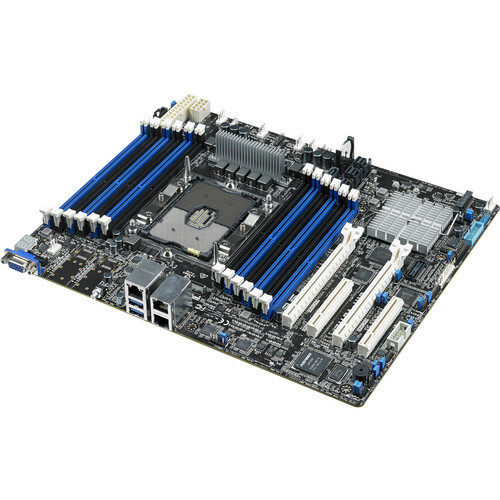 This motherboard has three mini-SAS HD headers that support up to twelve SATA III 6 Gb/s ports. Additionally, a 7-pin SATA port provides flexibility to connect to an optical drive or extra SATA device. The ASMB9-iKVM module enables remote BIOS updates, fan control, standalone KVM with an HTML 5 interface, video recording, and BSOD capture. With out-of-band management, ASMB9-iKVM provides around-the-clock remote monitoring and diagnostics — even if the server operating system is down or offline — through a user-friendly web-based graphical interface that works with all major browsers. The ASUS Control Center (ACC) is a centralized and integrated IT management platform for monitoring and controlling ASUS commercial products, including servers, workstations, and digital signage. ACC enables easier server management with functions such as BIOS updating without restarting the system, remote monitoring of multiple systems via mobile devices, and one-click software updates and dispatching. This motherboard comes with ASUS ProCool power connectors, which decrease power connector temperatures for reduced power loss and increased cost savings. Box Dimensions (LxWxH) 13.3 x 11.0 x 3.2"